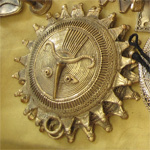 The traditional bell-metal craft popularly called dhokra is a typical tribal craft with its mesh- like features giving it its distinctive beauty. Tribal families in villages near Dhenkaral town cast boxes, figures of gods and goddesses, and lamps using the lost wax technique. 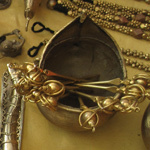 Craftspersons are spread out throughout the state, making various religious and household utensils. The kansari community of Odisha are experts at making bell-metal cook ware. 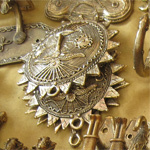 Bell- metal has a gold tinted surface and is made from an alloy of copper and brass. 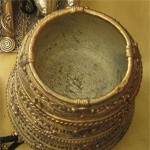 Bolangir district of Odisha is famous for its silver ware. A heavily ornamented plate, traditionally used for offering betel leaves and nuts, has its inner space divided into many parallel circular rings, each carved out beautifully. The outer ring has flower beds, the second has creepers, the third has fruits, and the innermost illustrates a butterfly sucking honey from flowers. 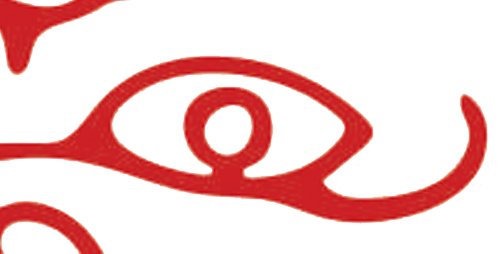 The edges consist of semi-circular curvatures with figures of the moon and a star on each of the protruding portions.